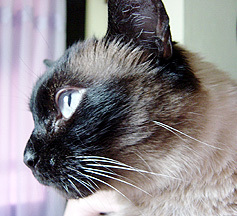 Rajsha our beloved cat. 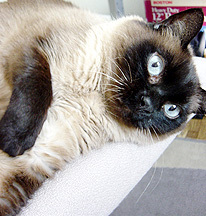 She was a beautiful Tonkinese. 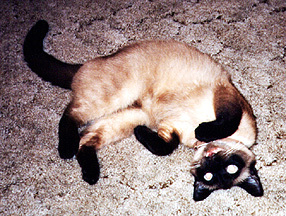 Ramsay, Rajsha born September ?, 1994; was laid to rest on July 5, 2005. 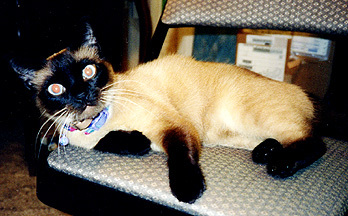 Gentle "Boo", who brought so much happiness to our lives. 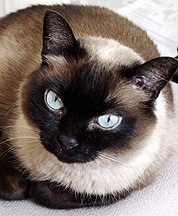 A rescued cat from the streets of Long Beach. She provided unconditional love, and helped us through our darkest times. We will miss you Rajsha. Rajsha had so much energy as a youngster. She loved performing a fake, "oh, I am defenseless" move before chomping my hand. 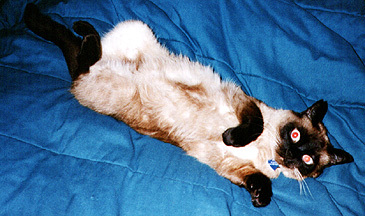 Rajsha frequently lounged on our comforter, leaving a nice trail of fur. Rajsha often relaxed in her beanbag chair. This way, she could survey all activities in the living room. Rajsha spaced out after a toke of nip. In her older years, Rajsha spent most of her time dozing off. Rajsha's last day... bathed in light. Goodbye, dear friend.